These days, it seems every family has tons of photos, music, and videos stored in different places and on different devices. Convenient access to this content to enjoy and share in a variety of ways is increasingly essential in modern homes. QNAP Turbo NAS features rich multimedia applications and acts as a home multimedia “hub” for storing files from family members and making them available on various devices, in the home and on the go. You can browse photos or play music and videos on DLNA compatible devices, enjoy digital videos on mobile devices, and easily share them with family members and friends. 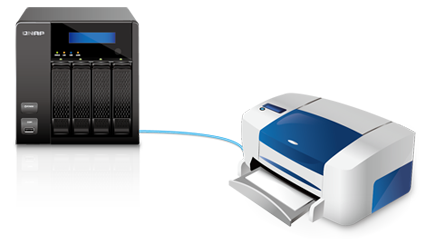 The Turbo NAS also serves as a printer center and download center to help simplify the tasks of sharing printers and downloading content. Find out how indispensible it is to have the Turbo NAS at home! Enjoy your recreational life with the Turbo NAS and transform the Turbo NAS into your multimedia center. The Turbo NAS offers large storage capacity for backing up your digital photo, music and video collections. Share multimedia content with family members and friends in numerous ways over the Internet as easy as 1..2..3. The Turbo NAS is a media center with DLNA/UPnP support. By using DLNA/UPnP digital devices, such as HDTV sets, Sony PS3, Microsoft Xbox 360 and Hi-Fi system, you can view photos and play videos, listen to music stored on the Turbo NAS, and even stream Internet radio stations from all over the world. Handheld devices have become an important part of our lives. We use it to check emails, listen to music, take photos, and do lots of other things. However, due to limited storage, we have to leave large collections of files at home. The QNAP Qmobile app enables you to stream photos, music and videos from the Turbo NAS and play the files directly on your iOS® or Android™ mobile devices. It is like having a multimedia center with terabytes of content in your pocket. Whenever you take a great shot on the phone, you can also instantly upload it to the Turbo NAS for secure storage and sharing. Photos capture all the beautiful memories and every moment of life, and you need a reliable device to back up the photos. The Turbo NAS features large storage capacity to be your life treasure box for backing up enormous amount of photos. No more worry about unexpected file loss or hard disk crash. The Photo Station utilizes the storage capacity of Turbo NAS and provides a convenient way to upload and share photos over the Internet. The intuitive web interface allows drag-and-drop convenience to upload a batch of photos from desktop computers to the Turbo NAS. 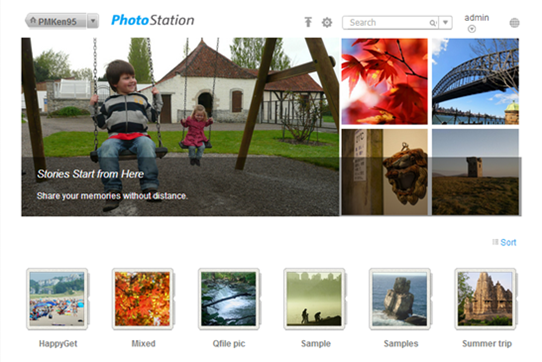 Simply organize uploaded photos into folders, and the Photo Station automatically creates online photo albums on a nicely arranged page for browsing on the web browsers. View the photos by slideshow with dazzling transition effects. Turn on the background music to add more fun while enjoying the photos. The offerings of thumbnails and photo title display presented with the slideshow enable you to preview the photos ahead. 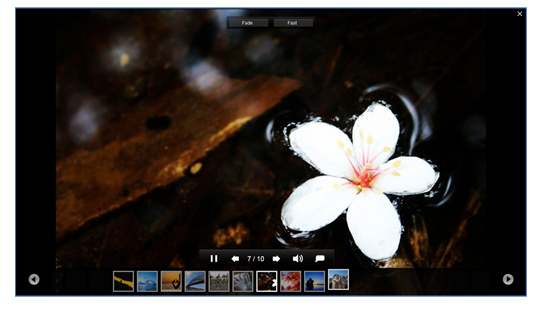 The Pixlr Editor allows you to edit photos with creative effects directly on the browser. On the photo albums, you can use geo-tagging function to pinpoint the location of the photo on Google maps so that viewers can identify where the photos were taken. 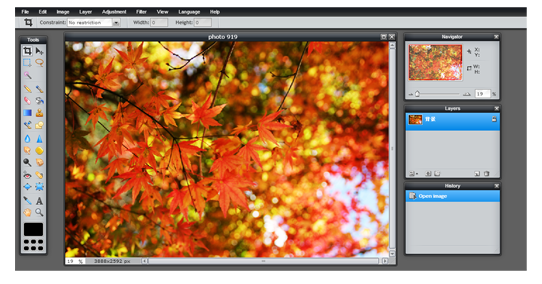 The thumbnail display of RAW photos makes it easier to preview and organize your professional shots. 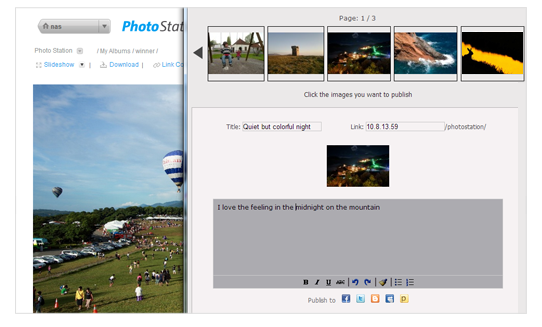 Photo sharing via Turbo NAS is easy and flexible. Sharing can be made public on Facebook, Google+, and Twitter, or private albums can be shared with specific friends through a password-protected slideshow link through email. Just share your visual memories easily in the way you prefer. You can also stream the photos from the Turbo NAS to a DLNA-compatible player and enjoy the photos on the big screen in the living room. The Music Station makes the Turbo NAS your personal music center in the cloud. Your music library stored in the Turbo NAS is well organized automatically and can be accessed through the web browser. With a few clicks, you can enjoy your music anywhere, anytime. With the iTunes server, you can share and play the MP3 files by iTunes player installed on any Mac or Windows PC on the home network. The Turbo NAS supports Logitech Media Server with a QPKG plugin. You can manage and access your music collections on the Turbo NAS, and then play with Logitech music players without even turning on the PC! The Turbo NAS supports DLNA/UPnP, enabling music streaming from the Turbo NAS. Enjoy high quality sounds at home on any DLNA/UPnP-compliant device. 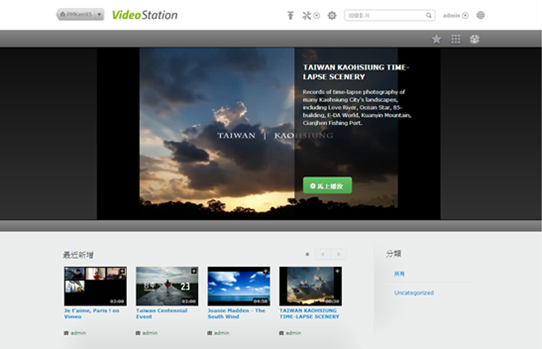 The Video Station is a great tool for playing your personal video collections online. Just upload your video collections, and sit back and enjoy them anywhere. To add more fun, you can share your video collections with family members or friends on social networking sites such as Facebook, Twitter, and Google+. The Turbo NAS features large storage capacity that makes it ideal storage for a treasure trove of ripped Blu-ray, DVD ISO files and your precious home videos. The Turbo NAS delivers high performance of data transferring to support multiple 1080p HD streams. Being DLNA certified, it can stream videos to DLNA/UPnP compatible TVs and devices. The whisper-quiet and energy-saving design of the Turbo NAS can fulfill your desire to set up a home theater and bring the cinema grade experience to your living room. 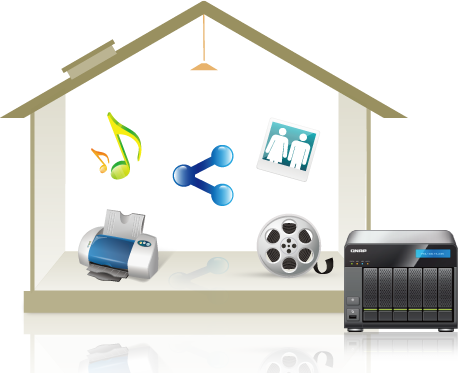 By connecting a compatible USB printer to the Turbo NAS, family members can instantly share the printer resources over the network at the same time, avoiding the complicated process of copying files around home just to print them out with the printer connected to a dedicated computer. The Turbo NAS supports IPP (Internet Printing Protocol), Samba, print job management, and Bonjour printing on Mac OS X. Typical Internet downloading requires the computers being turned on throughout the process, and it is usually energy-consuming. The Download Station serves as a non-stop download center. Once you finish managing download tasks, just turn off the computer. The download tasks will keep going until they are finished. The Download Station supports PT (Private Trackers),BT, eMule, NZB, Magnet link, HTTP/HTTPS and FTP/FTPS download. It also supports RSS download (broad catching) for automatic BT download. Available in the QPKG Center as optional installation, eMule support allows direct eMule file search and download, and NZB support enables file download by uploading NZB sources manually.